Lyons Area Amateur Radio Net (LAARN) is an outgrowth of Lyons Prepared, a volunteer group that came about as a result of the flooding we experienced in Lyons, Colorado in September of 2013. One of the critical problems we experienced in the Lyons area during the flood was the inability of our neighborhoods to establish reliable communication with emergency services. To this end, LAARN is an attempt to add another channel of communication, this one between Lyons-area ham radio operators and other ham radio emergency communication networks, for example, Boulder County Amateur Radio Emergency Services (BCARES). 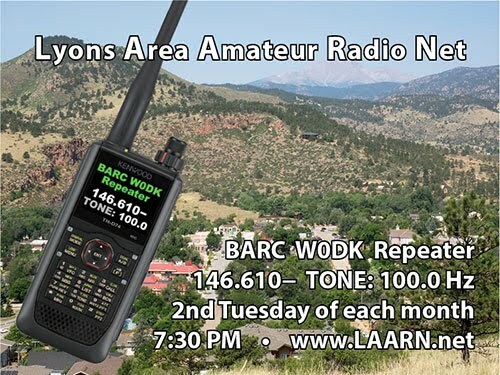 The Lyons Area Amateur Radio Net meets the 2nd Tuesday of every month at 7:30 PM on the BARC W0DK Repeater, 146.610− TONE: 100.0 Hz (fall back: 146.460 MHz simplex). It's an informal net and usually runs about a half hour. We share good conversation, technical assistance, equipment suggestions, and emergency preparedness tips. All licensed amateur radio operators are welcome. In the event of an emergency event during which normal phone and other forms of communication become unavailable, we encourage Lyons-area Hams to meet up on 146.460 at noon and 8 PM daily. As the nature of the emergency becomes better understood, this may be scaled up or down. BARC W0DK Repeater, 146.610− TONE: 100.0 Hz, IRLP node: 7007; Echo Link 6664. Jim, W8ERI, and Dayton, K6DJ, of the Boulder Amateur Radio Club are hosting the repeater here in Lyons. Thanks also to Dave, KI0HG for his technical wizardry in helping get it on the air.